Fire is essential to survival. You need it for warmth, to cook food, and to boil water for purification. 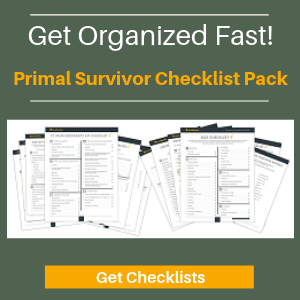 So, it is no wonder that survivalists recommend keeping a ferrocerium rod – aka ferro rod – in your survival bag. What they don’t tell you is that starting a fire with a ferro rod isn’t as easy as it seems. 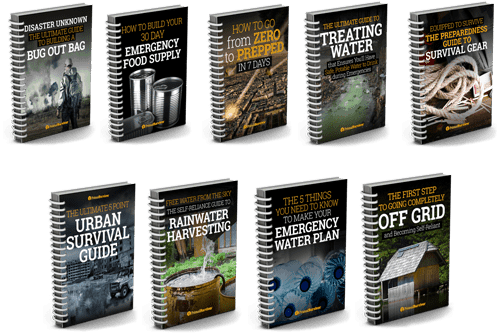 Here are expert tips to make sure you actually can use your ferro rod in an emergency situation. Ferrocerium rods are made from a mixture of various metals. Outdoor Life says that they are usually made from 50% cerium, 25% lanthanum, and 19% iron with some small amounts of other metals in there. The recipe used by ferro rod manufacturers varies. Some survivalists will tell you to avoid cheap Chinese-made ferro rods because they have low amounts of cerium. However, I’ve found that even the cheapest ferro rod will get the job done. I’m convinced that anyone who tells you that you need an expensive ferro rod is just trying to sell you their gear. However, the LENGTH and WIDTH of the ferro rod matter! The longer the ferro rod is, the more contact time you will have on the surface when you slide the striker over it. The wider the ferro rod is, the more surface area you have and more sparks will fly off. If your ferro rod is going to be part of your Everyday Carry, you probably don’t want a goliath rod to carry around. However, if you are just getting started, I’d suggest that you get a larger ferro rod to practice with. It will be easier to hone your technique with the larger ferro rod. *Once you receive your ferro rod in the mail, you’ll notice that it has a black coating on it. This is to prevent rust. You’ll need to scrape some of this off. You should be able to see a shiny area where you are scraping. This is a nicer ferro rod, but a cheap one will work too. While the quality of the ferro rod doesn’t matter too much, the quality of the striker (aka scraper) does matter! The small, flimsy strikers that come with cheap ferro rods are don’t give you much control. The edges of these also aren’t very sharp, so you won’t be able to make many sparks. Remember, the key to using a ferro rod is strong, controlled strokes! You’ll need a good scraper to do this. 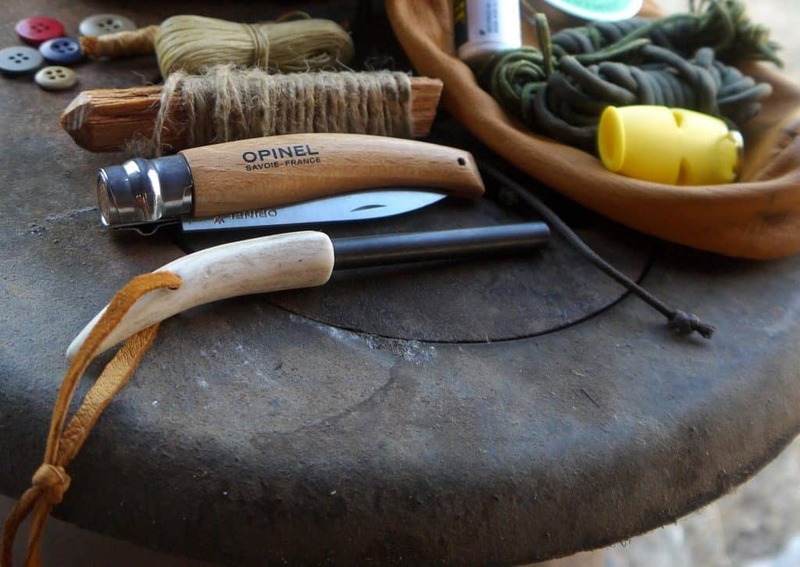 The best striker for a ferro rod is the back of your fixed-blade survival knife (read about how to choose a survival knife here). NEVER STRIKE A FERRO ROD WITH YOUR KNIFE BLADE! Doing this will cause your knife to get dull very quickly. Instead, you should use the flat, squared-off back edge of the blade. Hopefully you’ve chosen a survival knife which does have a 90-degree edge on the spine. Alternatively, the saw blade on a multi-tool makes a great ferro rod striker. The saw blade is strong but flexible, thus giving it good drag across the surface of the ferro rod. If you don’t have a knife, saw blade, or the striker that came with your ferro rod, you can use any number of items as an alternative striker. Trash like broken glass works well (which you can unfortunately almost always find in the wilderness). Hard rocks also make good scrapers. 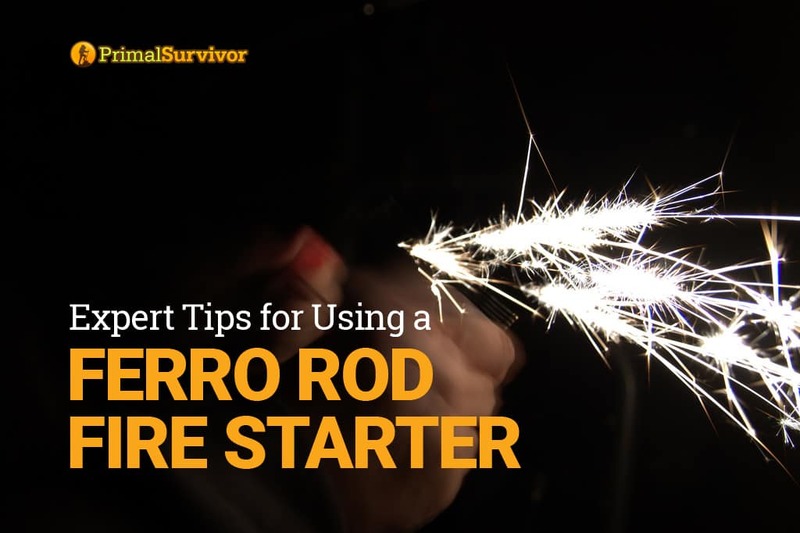 We call ferro rods “fire starters.” But a ferro rod will NEVER make a fire. Ferro rods make SPARKS. Making a fire out of sparks can be really tricky. You’ve got to get the sparks to land on VERY DRY and FLUFFY tinder. Otherwise, the sparks are just going to die out before they can ignite your tinder. Tinder which would normally work well for matches or a lighter might be too large and heavy for starting a fire with sparks. A lot of survivalists recommend using a cotton ball with petroleum jelly on it as tinder. 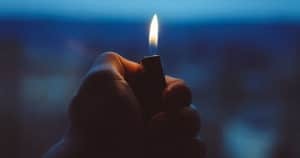 But, if you thought far enough ahead to bring cotton balls with you, then you probably should have brought a spare lighter and more matches. Other than in practice scenarios, I can’t imagine when I’d realistically have cotton balls but no matches. 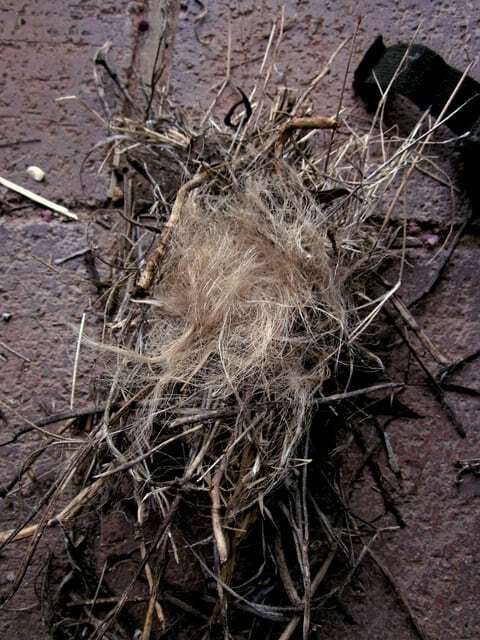 Fluff and dry grass don’t always produce a full flame, and feathersticks can take a while to catch on fire. I’ve found that the best solution for starting a fire with a ferro rod is to use all three of these tinder types. 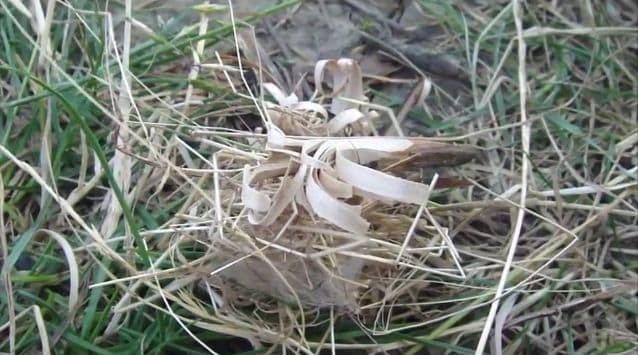 With this setup, the fluff and dry grass will catch your featherstick on fire, which can then be used to light your kindling and make a fire. You can see a video of it in action here. 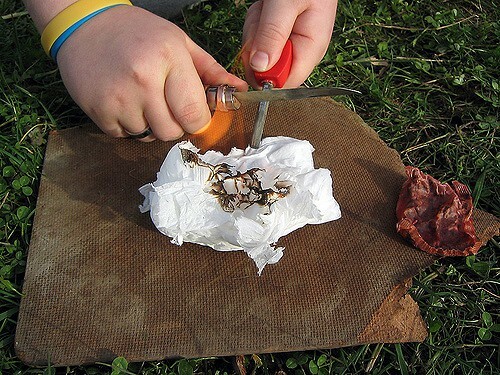 An even better method of making fire with a ferro rod is to use a char cloth. A char cloth is made from 100% cotton which has been turned into charcoal. 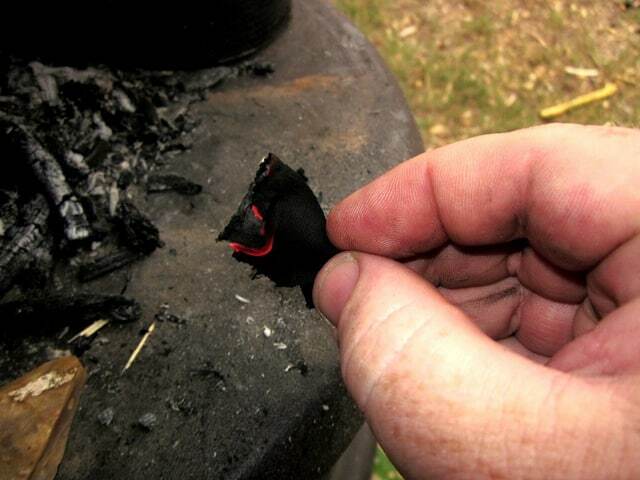 Charcoal ignites to produce a hot ember very easily. You can make your own char cloth easily out of a piece of old t-shirt. The Catch 22 here is that you need fire to make a char cloth. In a wilderness survival situation, you’ll have to get the first fire going with whatever tinder you find. Use this fire to make your char cloth and you’ll be able to easily make future fires with the char cloth. 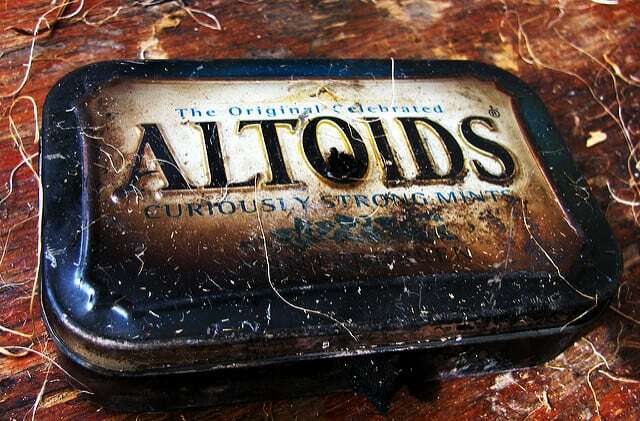 Find an old, empty can with a lid that fits snugly (an Altoids tin works well). Clean and dry it. Poke one small hole (about 1/16 inch) in the center of the lid. Make a small fire and let it burn down into coals. Put the cloth in the can and put the lid on top. Make sure the lid fits snugly!!! Otherwise, oxygen will get in and burn up the cloth instead of turning it into charcoal. Put the can on top of the hot coals. You should see smoke coming out of the hole in the can’s lid. When the smoke stops coming out, take the can off the coals. Let the can cool and then open it. Do NOT open the can right away as the cloth may ignite! The cloth should be black. If it is brown, that means you need to cook it longer. It should NOT be crumbly. This means that oxygen has gotten to it and it is not charcoal. *If you don’t have a suitable can for making char cloth, you can wrap your cloth in a packet of tinfoil which has one hole poked into it. A lot of people make the mistake of using a ferro rod like a match. But a ferro rod does NOT need to be struck very quickly and delicately. Rather, you need sturdy, strong strokes to make lots of sparks fly off of it. Hold the scraper at a 45-degree angle. The end of the ferro rod needs to be right next to your tinder. Pull the ROD back, not the scraper! Sparks should rain down on your tinder and light it. Tip 1: Note that step 3 is to move the rod, not the scraper. This method is much more effective because you’ll be able to get sparks closer to the tinder. By contrast, when you move the scraper instead of the rod, your hand gets too close to the tinder. You’ll either knock over your tinder or the sparks will cool down too much by the time they land on it. The “move the rod” method also makes it easier to get your sparks dead center on the tinder instead of showering them all over the place. Tip 2: Ferro rods only work if your tinder is VERY DRY. If your tinder is even a bit damp, you won’t be able to make it ignite from the sparks. One expert solution is to rub the rod back and forth over the scraper. It will produce many sparks which will dry out your tinder so it can ignite. 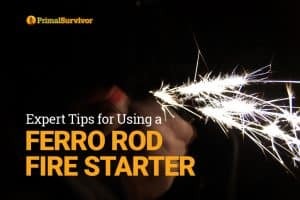 The best advice I can give for starting a fire with a ferro rod is to practice! Start by practicing with something easy, such as a cotton ball with petroleum jelly on it. Then practice on different types of tinder, especially ones you’d find in wilderness survival situations. And don’t forget to practice with different types of scrapers too. 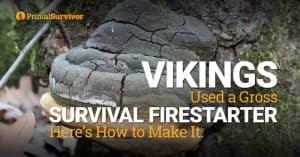 With a bit of practice, you’ll soon be a fire starting master! 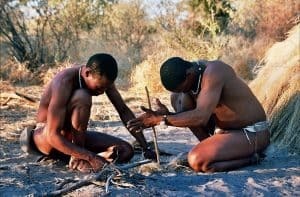 Or, try these methods of starting a fire without matches! 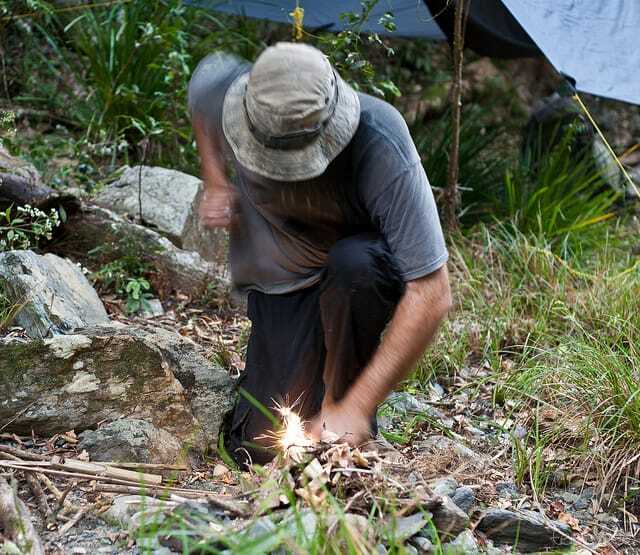 Have you used a ferro rod for making a fire? Let us know your tips and tricks in the comments! Hi Robert, thanks for the alternative tip. If you do run a test, drop a comment here, as we would all be interested in the results. If you can get some fatwood this makes very good tinder. Make a small pile of fine shavings and onc you get a spark to land on a fine enough part ot if you will have instant flame. Fatwood also has the benefit of burning longer with a nice hot flame. I have a small ferro rod attached to a piece of fatwood that works well but have also used fatwood I have found. what i mean is it snot smooth, its more of a heave choopy look to it now. just scrape slowly enough to not get sparks. I use hack saw blades. I break/cut them into 3″-4″ long pieces, grind the teeth off and smooth the edges from the bottom of the section I will be holding the striker. I leave saw blade teeth for 2″ or so but do grind them down by about half. I have found you get MUCH more sparks and material which continues to burn by using ground down saw blade teeth. More contact and yet enough teeth to scrape off material (which is what you want to happen). The sparks fly and the scraped off metal burns after the sparks are gone. The length of the saw blade means it is flexible. I use the pull-rod method also. With very little practice, you can aim the blade to throw the sparks and material where you want it. I also grind the front portion of the hack saw blade spine to ensure good 90 degree edges. You can use the spine of the blade as another scraping option. I drill a hole if needed, tie a lanyard and I am done. One of the things I have learned is you want a rod with more magnesium. I believe these rods are made of a metal combo referred to as “mischmetal”. The magnesium is the metal you see burning after the sparks have died off. I often see videos of people scraping their rod by moving their knives back and forth. Never understood why they would use this method. You scrape in the wrong direction 50% of the time, and moving a sharp cutting edge never seems like a good idea, especially when their are fingers near by. IMO you have better control pulling the rod. 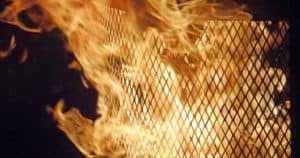 If you are trying to scrape off metal to act as an accelerant, carry a magnesium bar, or, magnesium shavings you made ahead of time and then carry with you in a aluminum pill carrier. You can use a drill and a drill bit of varying diameters to get the size of shavings you believe will work best. Just start drilling into the magnesium bar and save the shavings. Hey Bob – very interesting technique – thanks for sharing. Dryer lint works well as an ignition medium. Lights quickly, burns fast, and is easy to come by. I love birch bark, used it as a beginner this morning, worked great! Made sure to put out fire very thoroughly as it was very windy. Yeah birch bark is an amazing substance, has many other uses too. Look out for a post on that!